Happy Halloween from our Yarmouth dentist family to yours! Many of you and your young ones will be out and about tonight,taking in the festivities, racing from home to home, trick or treating. But despite the fun, it is important to remember to take care of your teeth. After all, we don’t want to see an overload of candy ruining your gorgeous smile. One single night of fun and sweets can begin a lifetime of preventable dental problems. 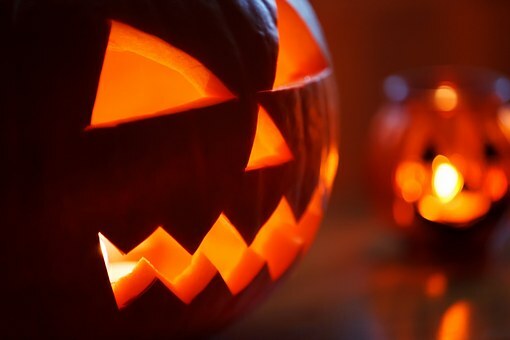 The good news is that adults and children alike can take steps to protect their smile, while still being able to enjoy the ghosts and ghouls and sweets and treats. First things first; everyone needs to brush their teeth twice a day. We also need to remember to floss daily to prevent periodontal disease. On Halloween, it is especially important to remember your teeth and practice good oral hygiene. You may be tuckered out after a night of trick-or-treating, but that is no excuse. Brush away the sticky, sweet sugars as quickly as possible. This way bacteria and plaque won’t be able to create a haunted disaster in your mouth. Between the ages of 6 and 12, children can benefit from dental sealants. Adults who don’t have tooth decay are candidates as well. The dental sealants protect the chewing surfaces of your teeth so that tooth decay can’t destroy your teeth. We paint the surfaces of your teeth, especially the molars, which will then harden when a special light is used. This keeps food and plaque out of the grooves and small crevices of your teeth. Our Yarmouth dentist recommends sealants on all permanent molars when they first come in so that our patients can avoid the hassle of any cavities. We know the favorite houses in your neighborhoods give out candy instead of healthy treats. Luckily, you can take steps before and after the festivities to keep your teeth healthy despite the candy. Fill up on a good dinner or fruits and veggies before you go haunting. Make an effort to stay away from candies that are sticky in nature like taffy or gummy candies. These types of candy are hard to brush off of your teeth and can quickly begin damaging your tooth enamel. Ensure everyone in your family goes to bed with a clean mouth, and limit the amount of candy they eat before bedtime. The best advice, if you are going to eat the treats anyway, is to have a piece of candy as your dessert, directly after dinner. Your saliva is already working to clean away food left behind on your teeth and will help do the same with your sweets. Halloween is a great night of laughter and fun, but without proper oral hygiene, the holiday can haunt you for the rest of the year in the form of tooth decay. Check out our Yarmouth dentist Facebook page to learn how you can take care of your family’s smiles, or give us a call to learn about our sealants and preventive dentistry services.